This entry was posted in Algeria, History, Infantry Combat, List, Movie, Trailer, War Movie, WWI, WWII and tagged A Captain's Honor, A Very Long Engagement, Algeria, Dien Bien Phu, French war movies, Grand Illusion, Hiroshima Mon Amour, Intimate enemies, Joyeux Noël, L'armée des ombres, L'armée du Crime, L'ennemi intime, L'Honneur d'un Capitaine, La chambre des officiers, La Grande Illusion, Le pianiste, List, Merry Christmas, Movie Trailer, Movies, Night and Fog, Nuit et Brouillard, The Army of Crime, The Army of Shadows, The officers' ward, The Pianist, Un long dimanche de fiançailles, War Movies, WWI, WWII. I’ve seen most of these–not all. I haven’t seen A Capt’s Honour and Dien Bien Phu–not sure if I want to see the latter. Have you seen Black and White in Color? I really like that one, and le Silence de la Mer comes to mind. I’d have to add Beau Travail too. I fiddled around with this list for days. I had Le Silence the la mer in it and also Au revoir les enfants, took them off again. 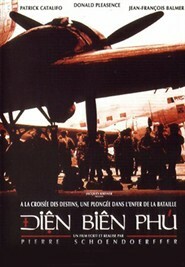 Dien Bien Phu isn’t very graphic but I need to re-watch it . I’m not sure about Black and White in color. It does ring a bell… I’ll investigate. I love when you do these foreign film lists. Gives me so many ideas for my Net Flix queue. Actually, thanks to you I have already seen four and loved three. I will be watching Hiroshima, Mon Amour this month. Of the rest, Intimate Enemies sounds most interesting to me. I’m sure you would like Intimate Enemies. You will have to watch Grand Illusion as it is on your 100 list. You will need to watch Le pianiste. It’s stunning. I also think The Officer’s Ward might be something you could like. Hiroshima Mon Amour, I have my doubts but you will “have to” as this months readalong is rather a watchalong. And you already know REsnais from Night and Fog. there are some similarities from what I remember. I think it’s very difficult to narrow down French War films–there are so many really really good ones. It’s the same thing, BTW, with French crime film…. In terms of combat movies Intimate Enemies is as good as the best from other countries. I was thinking that they were all somewhere between 8-10 on a scale of 1-10 which is a high average. You are right about the crime films, at least as far as I can judge. I hope you notice you won a DVD! You have to watch Les Croix de Bois, some amazing WW1 battle scenes, with vets as actors. As good as All Quiet on the Western Front, look for it on youtube. Thanks a lot JB. I will certainly do that. I’m very thankful for reccomendations. That’s quite alright, António. I don’t close the threads down. I’m glad you like my site. Thanks for visisting. I agree with you but I didn’t want to include too many of Schoendoerffer’s movies. He is excellent and when it comes to French war movies, he certainly is the place to go to. I hope you will like L’enemie intime. I think it’s very good. I will review most of Schoendoerffer’s movies this year but I need to re-watch them first. what about le section 317?…also by Schoendoerffer. I agree, it’s an excellent movie and I have reviewed it as well but I wanted to stick to 12 films. Bruno Dumont’s Flanders (2006) is a great example of what an “anti war-film” (as opposed to an “anti-war film”) can be. I haven’t seen that one yet. But the distinction is interesting. The thing is, i had been recently watching a series of 1930’s Soviet films dealing at least partly with WWI (Pudovkin’s The Fall of St Petersburg, Dovzhenko’s Arsenal). They were supposed to be “anti-war”, yet it struck me that their 10-15 minutes lyrical sequences about the conflict, albeit visually very powerful – especially Dovzhenko’s – could actually be quite ambiguous. Is it true that, as Truffaut supposedly said, you cannot film war and be entirely anti-war at the same time? Dumont’s Flanders quotes Kubrick openly, which brought to my memory several studies about Kubrick’s Full Metal Jacket, notably Janet C. Moore’s paper (For Fighting and for Fun: Kubrick’s Complicitous Critique in Full Metal Jacket). Is a complicitous critique the best a filmmaker can do when it comes to war? In my opinion, Dumont’s un-glamourizing gaze upon violence and suffering is a remarkable attempt at searching for another path* – however displeasurable the result may be. (*) Godard had tried another in Les Carabiniers. I haven’t seen it. I remember watching Full Metal jacket for the first time nd wondering how anti-war it really was as clearly there are a lot of people watching it who are fond of the film for the opposite reasons. Especially the iconic Animal Mother has a huge fan base. I have to hunt for WWI movies more systemtically next year and will have a look at some of yur suggestions. Thanks. The whole of it is on YT actually. In French cinema ‘Resistance movies’ are a subgenre in itself. Recent productions seem focused on (today’s) social groups that have hardly been represented before in that particular historical context: women (Female Agents, 2008), East-European immigrants (Army of Crime, 2009). In the same wave, Free Men (2011) tells the story of a network of North-African immigrants revolving around the Paris Great Mosque. It’s watchable thanks to its male lead (Tahar ‘A Prophet’ Rahim) and an interesting reconstitution of an ‘Arab Paris’ in the early 40’s – yet I think its contemporary theses are too obvious to be compelling. Still, this sounds in teresting. I’ll have to see if I can find it. Interesting angle. Thanks for telling me about it. Rebellion (M. Kassovitz, 2011) is about a military operation in New Caledonia (a French territory in the Pacific) against a group of independence fighters who, after having attacked a gendarmerie barracks and killed three gendarmes, are holding 30 as hostages right in the middle of the 1988 presidential election. Though heavy-handed and at times a tad confusing (as it tries to embrace too many layers), it is quite watchable as a parable according to which, when mighty political forces and serious firepower are involved, ‘diplomatic’ and ‘humanitarian’ solutions don’t weigh much. I’ve never seen a movie based on New Caledonian history. That sounds interesting. I know this article is pretty old. But, for those who are still reading comments, i can add 3 good french war movies. Action is set in the Balkans front during the First World War and immediatly after. Capitaine Conan leads a french commandos company, a pure war dog. The movie depicts some aspects on how soldiers can endure a war. A political war movie. You must know one thing. In France, just before the movie has been released, former fighters from french colonies never had their war indemnities. That’s why this movie has been released. A kind of: “French people, don’t forget what my father or my grand father did for all of us”. Now, the movie. It depicts the fictious war story (based on real events) of 3 algerians and 2 moroccan soldiers from the Campaign of Italy in 1943 to the Alsace region in 1945. This movie depicts the Dunkirk evacuation in 1940 from a french point of view. Combat scenes are soft, don’t expect an infantry combat movie. The title of second movie is false. I’ve just translated from french to english. But the english title is completly different. The movie’s name is Days of Glory in english. Thanks so much, Roudou. I’m always grateful for suggestions. I hadn’t heard of Weekend at Dunkirk. I’ve seen the others. They are very good. To be honest i don’t remember well Weekend at Dunkirk, last time i’ve seen it, i was a child, more than 15 years ago. It’s maybe not a real war movie But i think it’s interesting to see another point of view than the british one. Another french ” maybe not real war movie” came to my mind yesterday: Fort Saganne. I know this movie had a good succes when it came out. The incredible cast is certainly part of its success. But when i saw it, a long time ago, i was just boring. Maybe take a look at the plot of those two movies before you decide to watch them. I’ve seen Indigenous… Great ! Really beyond my expectation. Being a person from non-French speaking country, I find it very refreshing and enlighting to see other movies from different countries. This is very good list. Definitely will check them out.